A transport container (left) with the Tranquility module and Cupola is hoisted into position at Launch Pad 39A for installation inside the cargo bay of the waiting shuttle Endeavour on Monday, Jan. 18, 2010. Launch of the STS-130 mission is set for Feb. 7. The weekend weather forecast is shaping up to give NASA?sspace shuttle Endeavour a good chance of blasting off before dawn on Sunday. 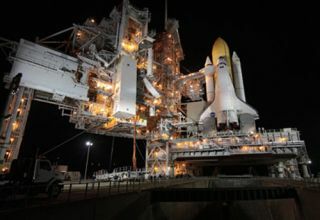 Endeavour and its crew of six astronauts have a 70 percent chanceof pristine weather conditions for their planned 4:39 a.m. EST (0939 GMT)launch from NASA?s Kennedy Space Center in Florida on Sunday. The predawnblastoff is slated to be NASA?s last ever shuttle launchin darkness. Kathy Winters, NASA?s shuttle weather officer, said only thepotential for high winds poses a threat to the upcoming shuttle launch. At launchtime Sunday, those winds are still expected to be within acceptable limits, sheadded. Commanded by veteran astronaut George Zamka, Endeavour?sfive-man, one-woman crew is set to fly a 13-day mission to the InternationalSpace Station. The shuttle is hauling a brand-new room for the station, called Tranquility,as well as a seven-window observation portal dubbed the Cupola. Zamka and his crewmates arrived at the Kennedy Space Centerin Cape Canaveral late Tuesday night and are on a skewed night-day schedule.During their ?daytime? in space, it will be late at night or before dawn in theUnited States. ?Welcome to the STS-130 night shift,? Zamka said, referringto his mission?s designation. ?It?s the only shift we?ve got.? Endeavourastronauts plan to perform three spacewalks to hook up the new Tranquilitymodule. They will be working closely with the space station?s five-man crew. The space station is currently home to two Americanastronauts, two Russian cosmonauts and a Japanese spaceflyer. They?ve spent themonth gearing up for Endeavour?s arrival by moving a spare parts shelf, staginga spacewalk to activate a new docking port, and moving a Soyuz spacecraft tothat rooftop parking spot. But the work in space hasn?t stopped there. Earlier today,an unmanned Russian cargo ship launched toward the space station from Baikonur Cosmodromein Kazakhstan (though it was nighttime at the Central Asian launch site). The space freighter, dubbed Progress 36, is carrying morethan 2.5 tons of fresh food, equipment and other supplies for the space stationcrew. It will arrive Thursday night at 11:30 p.m. EST (0430 Friday GMT). Endeavour?s launch is the first of NASA five finalshuttle missions planned for this year before the three-orbiter fleet isretired to make way for future spacecraft. It will mark NASA?s 130th shuttleflight since the fleet began launching astronauts to orbit in 1981.